Exhibited: London, Gooden & Fox, Ltd., Edward Lear, 1812-1888: A loan exhibition, 15 October-1 November 1968, no. 109, plate XIII. Edward Lear first arrived in Italy in 1837 and is documented as having visited Tivoli for the first time the following year. Despite his many subsequent voyages throughout Europe, North Africa, the Middle East and India he always returned to Italy, making it his adopted home and the source of innumerable picturesque drawings, watercolors, oil sketches and paintings. 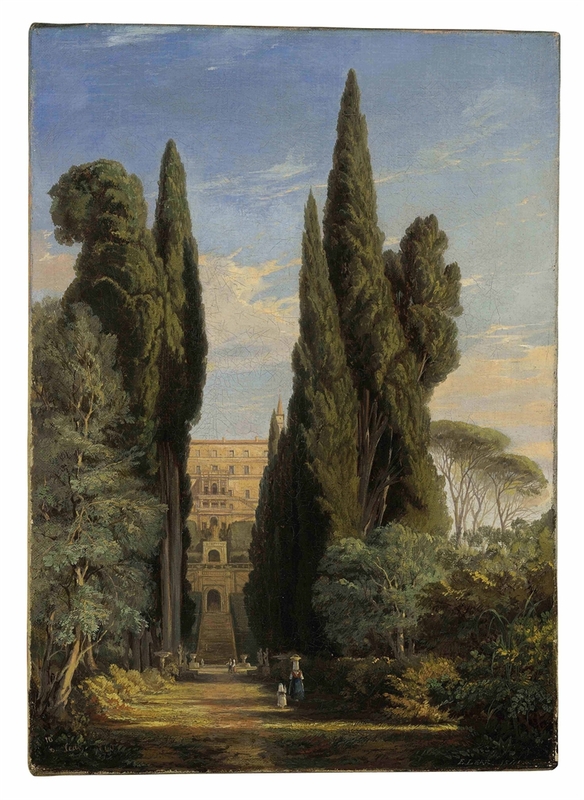 His view of the Villa d’Este through the allée of cypress trees is one of the most iconic Roman subjects — depicted by artists from Jean-Honoré Fragonard in the eighteenth century to Lear’s near-contemporary and fellow countryman, William John Thomas Collins, and countless artists in between. But it is also a rare early example of Lear working in oil, for in the 1830s and early 1840s he worked almost exclusively in pencil and watercolor and did not receive any formal training in oil paint until around 1848. The two dates of ‘1840’ and ‘1841’ on this canvas probably refer to the date of a drawing, most likely done in situ at Tivoli in 1840, which then became the basis for this oil painting completed in his studio in 1841. Lear practiced this technique throughout his career — often creating finished watercolors or oils months and sometimes years after his first studies. This composition was also used by Lear to illustrate Tennyson’s ‘The splendour falls on castle walls’. This entry was posted in Edward Lear and tagged Edward Lear, landscape, oil paintings. Bookmark the permalink.